HTC Bolt (HTC 10 Evo) Price, Specs, Release Date, Features: HTC, the renowned brand, has not launched any major project in the market. This may surprise everyone. 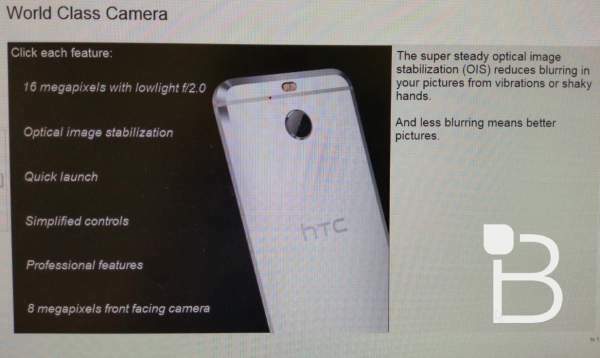 But HTC is planning some huge. The tech giant is currently working on a new smartphone that will be available in the market under the name ‘Bolt’ or HTC 10 Evo. The device is expected to be launched in this month. HTC Bolt features 5.5 inches 2K display with a resolution of 1440 x 2560 pixels (Quad-HD). Over the camera portion, there is a primary camera of 16 MP with an aperture of f/2.0 on the rear side with an OIS. On the front, there is a 8 MP shooter for capturing selfies and for the video calling facility. There will be a dual-LED flash on the back of the device. Other connectivity facilities like Wi-Fi, Bluetooth v4.0, NFC, GPS are available. There will also a USB type-C port embedded in the smartphone. Check: Audi A5 Cabriolet Specifications. There is a 3.5 mm headphone jack on the phone. It has got Boom Sound Adaptive Audio earphones in it which can provide 24-bit audio processing speed. The smartphone has got the IP57 certification which means that it can be submerged in as much as 3.3 feet for up to 30 min. Check: Lenovo Vibe P2 Specification. The phone is powered by 3,200 mAh battery and also supports 2 x 30 carrier aggregation. This aggregation allows it to receive and send the data at a way faster speed. The device is also resistant to water and dust. The smartphone will run on Android OS v7.0 Nougat. The company is offering RAM of 3 GB coupled with an internal memory of 64 GB. It is expected t be powered by the latest Snapdragon processor. There will be also a microSD card slot in the device which can expand the memory of the device. The company is offering the phone in two color variants. Available variants are Carbon Gray and Glacier Silver. The body of the device is composed of cladding in metal. If you will be going out to buy a new smartphone. Don’t forget to keep the HTC Bolt in your choice list. The device is expected to come in the market by 11 November. The smartphone is available for the pre-orders in Taiwan only. The price of the device is not fixed yet. And no predictions can be made on the pricing of the device.